Prizewinners announced during one-night event at Leeds' Ellington House. David Steans was announced as the winner of the inaugural Vantage Art Prize in Leeds yesterday, at the end of a one-night event of live art and performance at the spectacular out-of-town office space Ellington House. 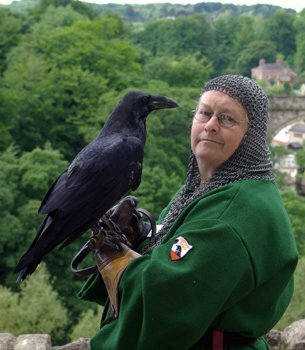 Steans wins the £1,000 award for his documentary video The Unkindness of Igraine Hustwitt Skelton, a portrait of Knaresborough Castle’s raven-keeper Janette Skelton. Second and third-prize winners, who receive £300 and £200 respectively, were Bess Martin for her Choose Your Own Adventure gallery tour of the exhibition and John Slemensek, for his ice sculpture Orbit that melted over the course of the evening. A special People’s Choice prize of £50 was awarded to Naomi Gilby for her work My Wallpaper. @DepartureArts A huge thank you to everybody who has been involved with #VANTAGEartprize and made it what it was last night. You’re all incredible! @bhaesa Had an amazing evening last night at the #vantageartprize a bit overwhelmed about translating the experience into words! @swifty_lufc #vantageartprize some weird stuff knocking about last night. Didn’t really get it all, but it really made me think and reassess my life. Vantage Art Prize: a new Departure for artist-led activity – we speak to curator Adam Young, Departure Foundation Director Robert Wort and artist John Slemensek about the city’s changing – and self-sustaining – art scene.